Administration fee for course amendments - please note swaps are subject to availability and at least 22 days notice. Please see our Terms and Conditions for full details. 1 hour 1 to 1 coaching with Dr Mahibur Rahman - this will be conducted using video / teleconferencing software. 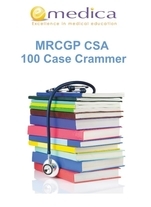 Dr Rahman offers coaching for GP careers guidance, MRCGP AKT, MRCGP CSA and for GP ST entry. Course Handout for our CSA 100 Case Crammer - 98 pages A4. Includes UK 1st class postage and packing. Course Handout for our GP Specialty Training: Getting Started course. Includes UK 1st class postage and packing. Course Handout for our Life After CCT: GP Survival Skills course. Includes UK 1st class postage and packing. Course Handout for other courses - Includes UK 1st class postage and packing. Please give us a call if you would like advice on GP training or careers.